Vacation Bible School is over for 2011, at least at Little Flock Baptist Church. A week of VBS is experiencing Jesus words first hand, fresh and real. What He said to His disciples, “Let the little children come unto me and forbid them not,” is lived out for five days in June. The first day the children came filing into the pew where I stood with my purple second grade sign, their faces were uncertain, some a little frightened not knowing what to expect from this experience. Would they get along, would they be accepted, would they like the food at snack time? On Tuesday, they came again, sleepy headed and wondering why they had to get up so early when school is out and it’s summer time. By Wednesday, they came with assurance, knowing the names of their classmates, feeling comfortable with the teachers, understanding the routine, and beginning to know the words to the songs. Some of them came talking up a storm. Some of them shyly slipped into the pew and waited patiently. Some needed lots of attention. Some were content to be lost in the crowd. Each one was special in his or her own fearfully and wonderfully created way. These children who were placed in our care for four hours a day, Monday through Friday, were there to learn a lot. Each rotation was to teach them Bible truths and reinforce the lesson of the day. Worship rally started it all off with a big bang and rockin’ music while a group of children helped Mr. Tim lead and teach the motions to the songs. Recreation was play with a purpose with the leader quoting a verse of Scripture before the children left him. Craft time reinforced the day’s theme with an art project. Missions helped the children think beyond their own little worlds. Bible study included activities, games, and a story that wrapped up what we all were trying to teach them, that God loves them, that He is trustworthy, that He wants to be a part of their lives. Reviewing the week has made me realize that I learned some things myself during those five mornings we spent together. I learned that every child does not know the story of Jesus; and I learned it was a joy I can’t describe to plant seed into freshly plowed ground. I learned that some of the children are being well trained by parents and church teachers. Sometimes they answered my questions with amazingly sound theology. I learned that some children do not need to speak to be heard. And I learned that listening to a child tell her stories can be the greatest gift I can give her. I learned that I want more patience. It takes a lot of patience during VBS. Children can be . . . well, children. I learned that showing love to a child can spread to a family, can touch a hard heart, and can break down walls. I learned that a week at VBS may be some of the most fruitful hours I spend in serving the Lord. Children are precious to God. He does not overlook a single one of them. In His holy wisdom, He has given us adults charge over them. Sometimes I honestly wonder why He entrusted their care to us when we mess up so often. But He did and that makes what we say to them and do with them so extremely important. One more thing, something I already knew. Children grow up too quickly. We have a short time to plow up the fallow ground, to plant seed, to nurture the tender plant, to water with the truth of the Word, and to love them the way God has loved us. That is a tall order and not one I take lightly. May God grant that I never offend one of these little ones, that I never push one away because I think I am “too busy” or have “important work” to do, that I always remember Jesus loves the little children, all the children of the world, red and yellow, black and white, they are precious in His sight. 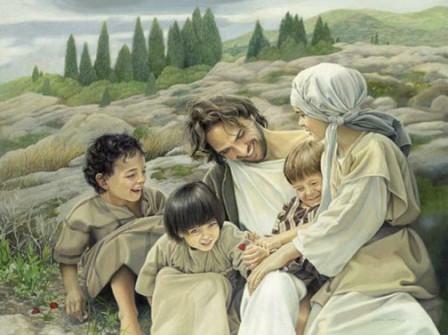 Jesus love the little children of the world. Vacation Bible School will be held at churches all over the country this week or sometime during the summer. Take your children. Be part of the volunteer team. Make a difference in the lives of children. Do it for the kingdom’s sake. Did you attend VBS as a child? Feel free to leave a memory.